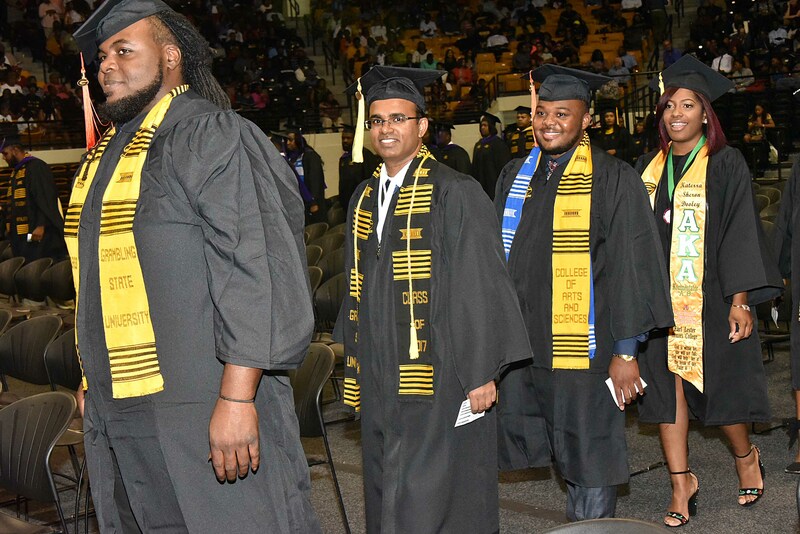 With a unanimous decision, the Louisiana State Board of Nursing approved Grambling State University’s plans for a new undergraduate nursing program, pending a Louisiana Board of Regents meeting. If all goes well, the program would start in fall 2018. Though the nursing board voted to support the new program, the board requires full approval from the Regents, and the Regents approved the program pending support from the nursing board. GSU must return to the Regents to get final approval, then the nursing board will allow Grambling State to move forward with the process. That is expected to be a formality. Nursing board members said the plans for the planned stringent, academically-rigorous program is what GSU needs. As developed and proposed in the approved letter of intent, the school’s new undergraduate nursing program would require specific preliminary general education and other courses and a strong academic history before a student could be admitted as a nursing major. 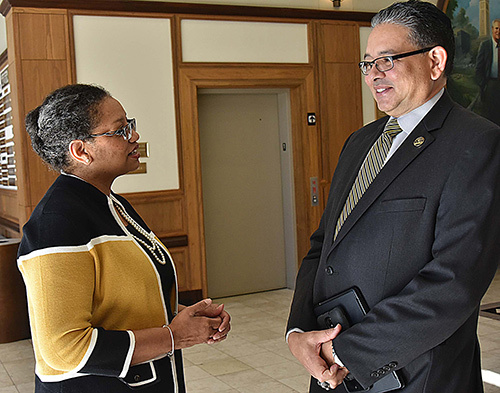 The board, meeting at the Louisiana State University Lod Cook Alumni Center on the LSU campus, urged Brown and GSU President Rick Gallot to continue the good work to get the new program in place. In essence, the board determined that GSU is well-positioned to move forward with plans for the program for the first full step of a multiple-step process. The board’s action authorizes the university to move to another important step — identifying and hiring faculty and preparing, putting curriculum changes in place and establishing regulations and rules before marketing the program. After successfully implementing the next set of actions, the institution hopes to be positioned by spring 2018 to promote a new undergraduate program and recruit students for its first cohort of 30 students for the program to start in fall 2018. “We’re happy to see you moving forward,” board president Laura Bonanno told Brown and GSU President Rick Gallot as they sat at a table in front of the board. 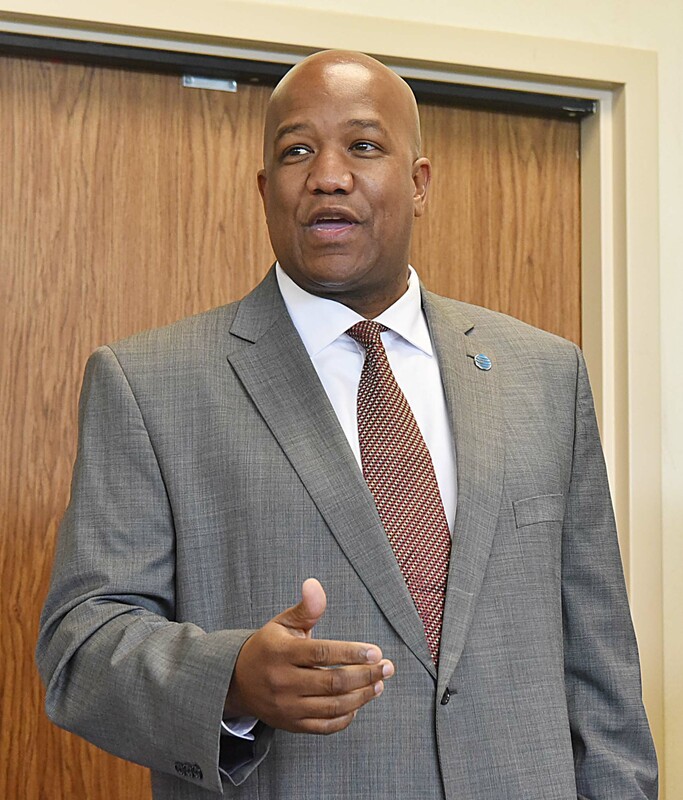 She said the board was excited that Gallot had taken the position as president in August 2016 and that he made the undergraduate nursing program a priority. 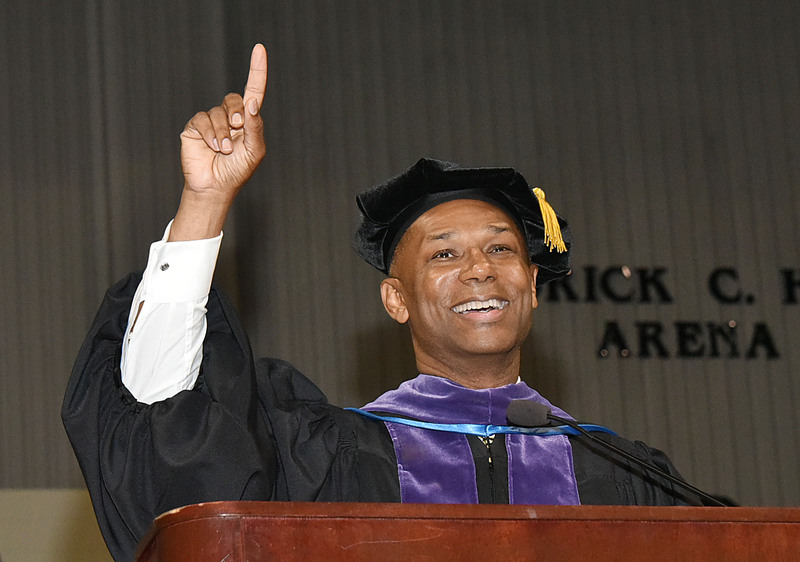 Board member Tavell Kindall made a point of saying that he is a two-time GSU nursing program graduate. Kindall, a board-certified family nurse practitioner who earned a doctorate in nursing practice, works at the Greater Ouachita Coalition Providing AIDS Resources and Education (GOCARE) in West Monroe, Louisiana. 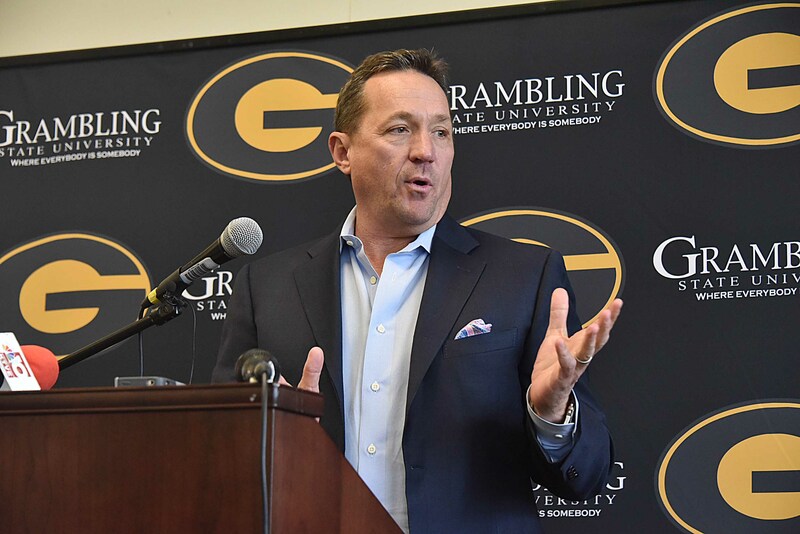 Gallot, whose wife, Christy Gallot, is a nurse with three nursing degrees from GSU’s nursing program, said it means a lot to the university’s first lady and fellow nursing alumni to have a strong nursing program and he’s committed to making that happen. This entry was posted in Uncategorized on June 8, 2017 by Greta Carter. A short walk from the Fredrick C. Hobdy Assembly Center, down a dirt road, beyond the Grambling State University facilities headquarters building, and Richmond Hall is one of about 20 ponds and a wooded area that’s been closed to the campus community and the public for years. Behind a locked gate, is a large area with several catfish ponds and a place that was once used for socializing, fishing, and education. Many students and residents may not have seen the area, but it’s recently been cleared and renovated into a place students and community members can enjoy once again. 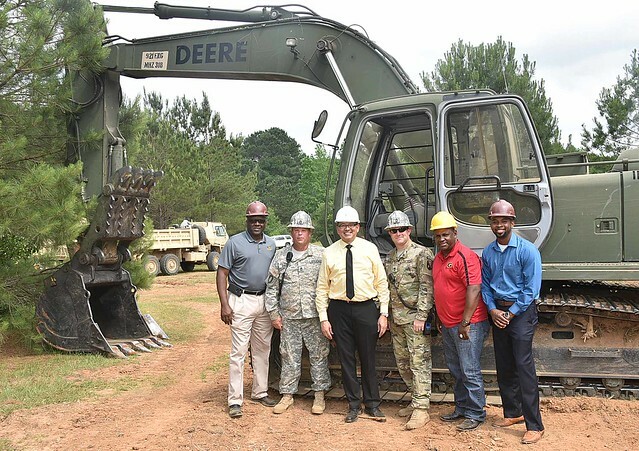 The $250,000 project, primarily funded by the Louisiana Army National Guard, will provide 15 acres for additional tailgating space for fall football games as the athletics complex grows, a place for academics with a focus on environmental research, and a safe place for recreational activities. The project started in early May and is scheduled to wrap up soon. Payne Montgomery supervised the area among his many duties when he worked at GSU until his retirement about 15 years ago. He remembers the area fondly as a place that he and others worked with students, and he’s happy to see it being used again. 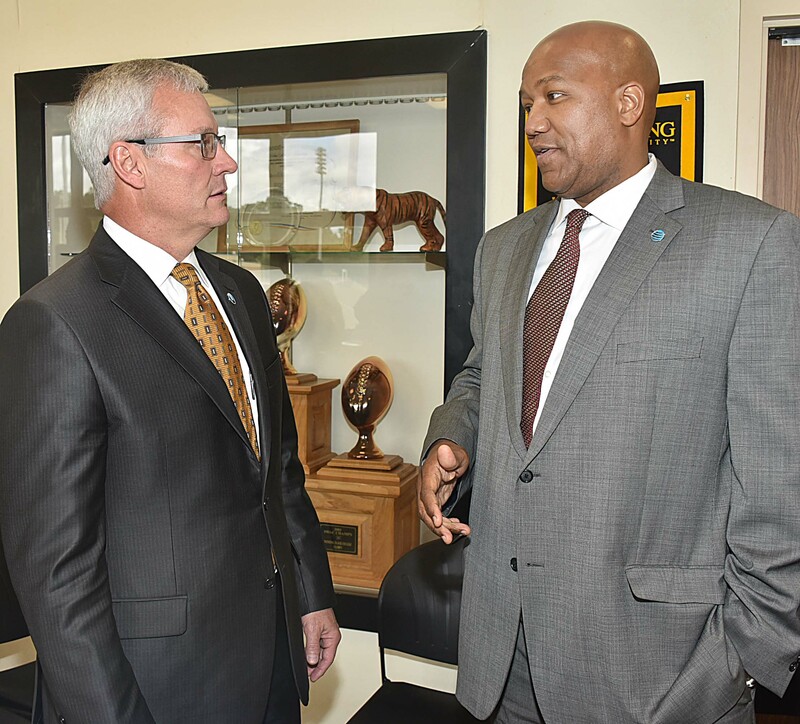 He said the Grambling Young Adult Conservation Corp program was created to use the area as a park with nature trails and general campus beautification as a way of attracting people to the campus and getting students interested in GSU. Capt. 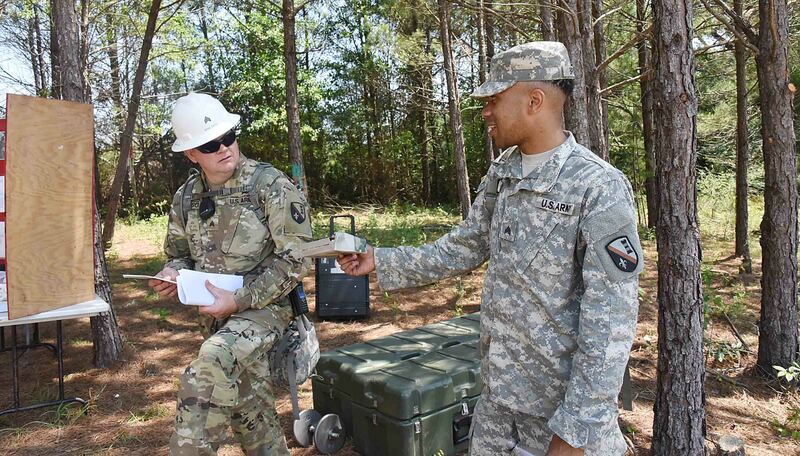 Antonio Tims, the Guard company commander for the work unit, is working with 15 men, including a couple of sergeants first class, a sergeant and specialists. The university has made the project easier by housing the soldiers at West Campus and providing meals in McCall Dining Hall with Aramark to eliminate travel to and from home. The project is taking a little longer than expected because of inclement weather, but Tims said it shouldn’t be much longer. The project is exciting to Gallot, who used the area in his younger days and plans to use it again when it’s ready. This entry was posted in Uncategorized on June 2, 2017 by admin. 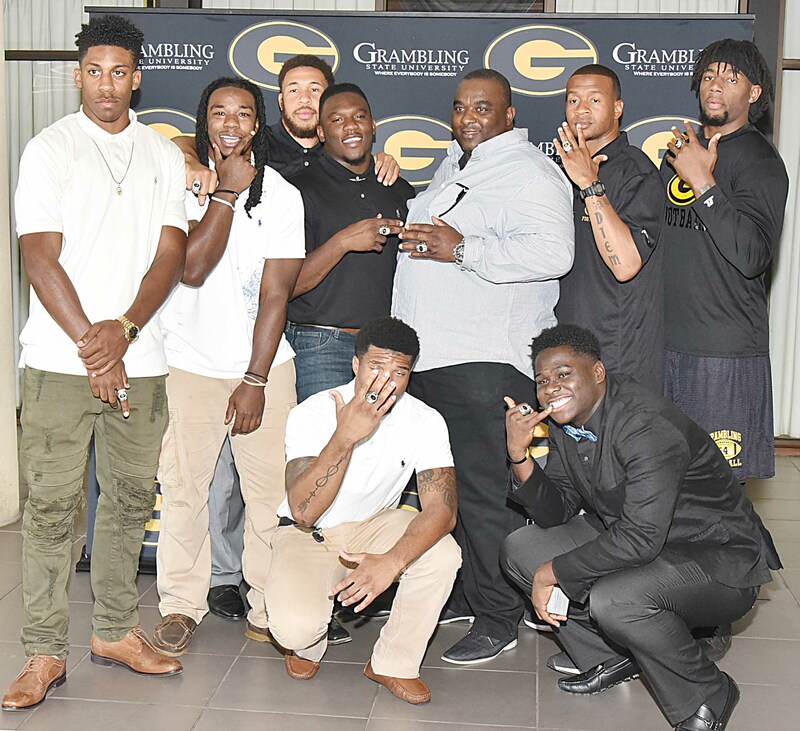 After an outstanding fall 2016 football season, the Grambling State University championship football team started wearing big rings proving that they are the 2016 HBCU National Champions. 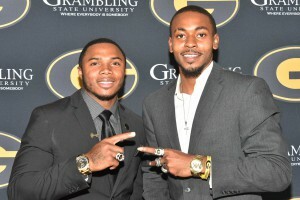 “It’s a great feeling to win both championships, the SWAC championship, and the national championship. 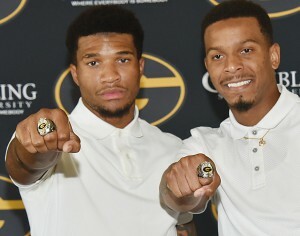 To finally get the ring is just a great feeling to have,” said Quintin Guice, 18, a wide receiver and sophomore engineering technology major from Monroe, Louisiana. GSU President Rick Gallot happily addressed a room of excited players, coaches and others. “This is the day to celebrate you,” said Gallot. “We have been anticipating this day for quite some time.” The G-Men ring distribution happened at the Black and Gold Room in the Favrot Student Union Building Wednesday (May 24). 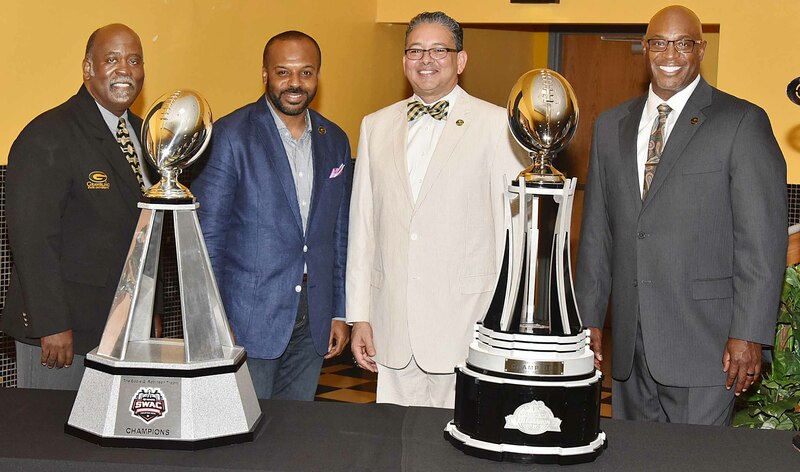 Head football coach Broderick Fobbs beamed with pride as he called the names of the players, coaches, support staff and others who made the championship possible. One by one, position by position, each went up to be recognized and to receive their rings. “If you ask anyone, I really love everyone I work with. I am passionate about my staff and about this team,” said Fobbs, who became emotional as he was thanking them, especially Rev. Lance Wright, the team’s chaplain, an important member of team. Fobbs said one of the reasons the football program has been successful is because they give young men something they want: God and love. 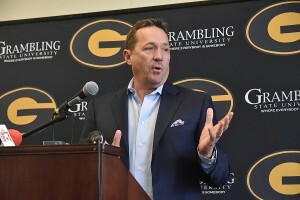 Athletics Director Paul Bryant celebrated with the players, saying he is joyful about their championship rings and their championship performance in classes. “I am so proud of the accomplishments of the G-Men on and off the field. 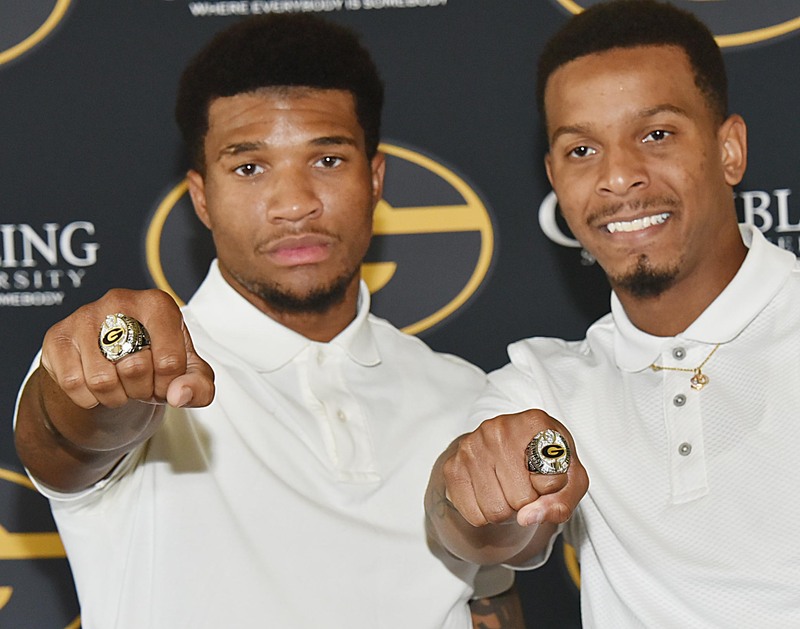 They represent what a championship program is supposed to look like in athletics, and it starts at the top with the coaching staff,” said Bryant. With the winning of a championship, the G-Men have gained support from all over the nation, even from people that might not be expected. 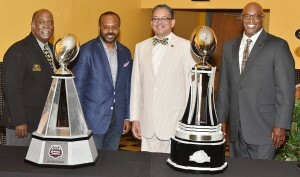 Calvin Braxton, an alumnus of Louisiana State University and a former board member of Southern University System Board of Supervisors surprised nearly everyone when he donated $30,000 to help cover the cost of the rings. “When I called Rick and asked him how much it cost, he said $30,000,” said Braxton. “So I said I would donate $3,000. Well this morning, I messed up and wrote a check for $30,000. Congratulations Tigers,” he said as the crowd roared, giving him a standing ovation. Gallot put the moment in context. “God will chase you down with blessings, and will surround you with people who want to support you,” said Gallot regarding the donation. Gallot and Braxton have been friends for many years. Obadiah Simmons, who was interim athletics director as the football team knocked out opponent after opponent on their way to the championship, received a standing ovation from the football players as Bryant thanked him for all he did to make the team successful, and the championship possible. This entry was posted in Uncategorized on May 25, 2017 by admin. Got twins? That’s nothing. 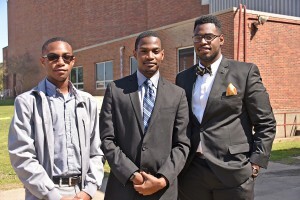 Grambling State University has triplets. “It’s awesome being a triplet. When you tell people you are triplets, it’s like you are a celebrity. You’re famous. They don’t believe it until they see all three faces,” said Stevie Wilson, the oldest triplet. Stevie Wilson, Steven Wilson and Stephon Wilson are freshmen from Winnfield, Louisiana. At 19, they have become quite involved in the campus life at GSU. As they wrap up their first year, they are becoming more and more popular. 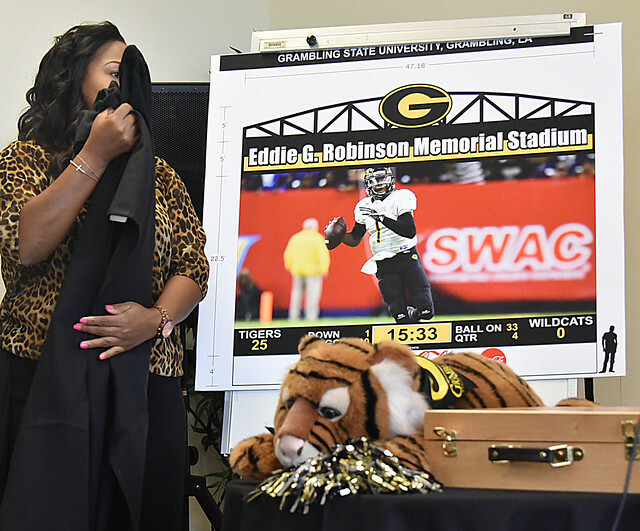 Ulrica Edwards, the university’s director of institutional research, said Grambling State does not keep data about sibling sets, but she recalls seeing twins on campus three to four times in recent years. According to the Centers for Disease Control and Prevention, there were 3,871 triplets born in 2015. That means the Winnfield Wilsons are a bit rare. 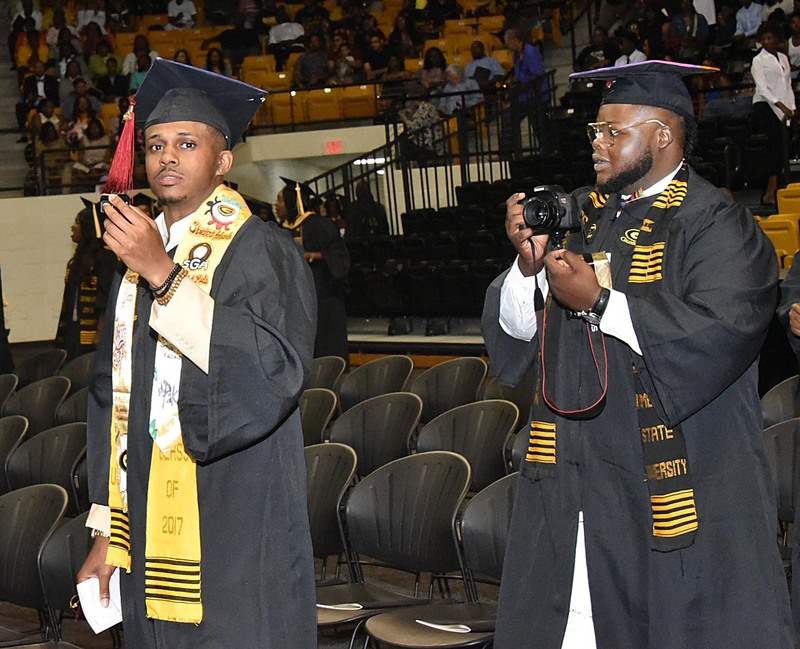 “We decided to go to Grambling because our mother is an alumna and we have several family members all the way from the 1950s that attended Grambling, and we are next in line,” said Stephon Wilson, the youngest by two minutes. 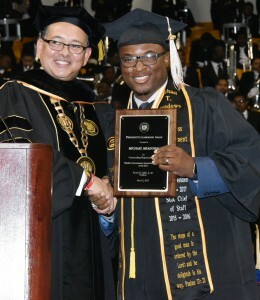 Stephon is a double major in business management and computer information systems. He loves to cook and started cooking in 2010. He is so good that he’s been to various cooking competitions and he and his brother Steven went to compete in the Great American Seafood Cookoff in August 2016. They were given a $500 award. His favorite dish is blackened alligator with apple and bellini vinaigrette. He wants to own a restaurant or work with the federal government in computer information systems. 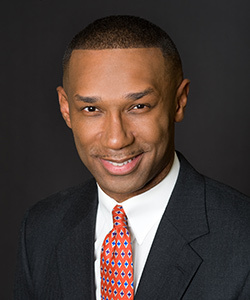 David “Rusty” Ponton, the interim vice president for student affairs, also known as Coach P, is pretty familiar with twins because his mother is one and he was born on their birthday. He said twins have been somewhat common at GSU, and he has seen them over the years many times. He can’t remember ever seeing a set of triplets. “Its kind of unique and it’s always an interesting story to see three young men all coming to the same place and they have different intentions on what they want to be in life,” stated Ponton. The triplets love to spend time together talking, going to the movies, vacationing, playing cards and mingling. “It’s fun because you’re able to bond with your brothers. No one wants to be lonesome and your brothers are like your friends,” said Steven, the middle triplet. People often can’t believe the brothers are part of a set of triplets. “We were at the nursing building and we were talking with Dr. Doris Williams and she didn’t believe we were triplets. Once we came together, we took a picture together,” said Stevie. Although Stevie and Steven are biology majors, they want to take different paths. Steven desires to be an anesthesiologist and Stevie wants to be a radiologist. They were born a minute apart. Steven plays the piano, cooks, sings, and likes to play football. He served as the GSU Student Government Association freshman class president. He was elected freshman vice president in the fall but when the former president had to step down, Steven stepped up to the plate. 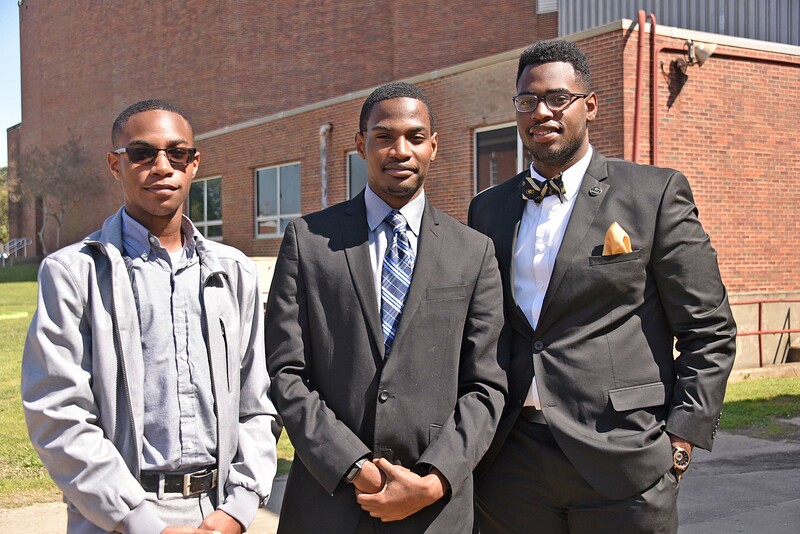 His favorite memory at GSU so far was when his brothers helped him campaign for freshman vice president. 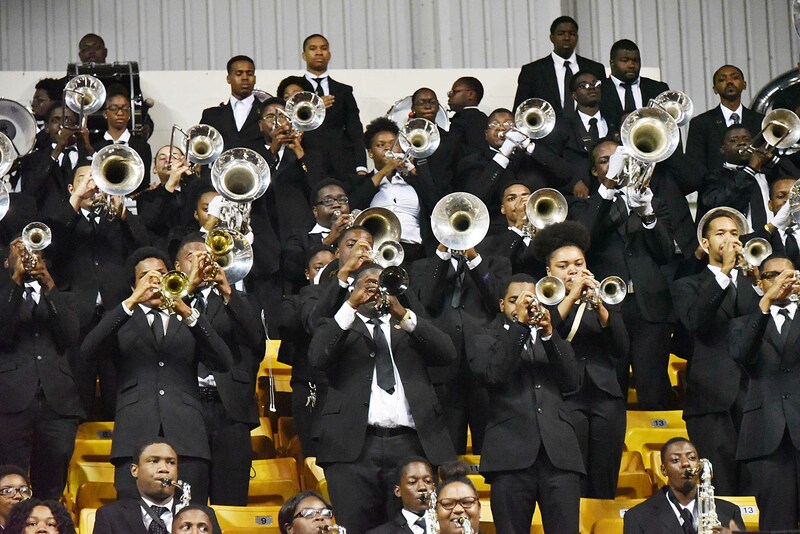 Stevie loves to play alto and tenor saxophone in the World Famed Tiger Marching Band. 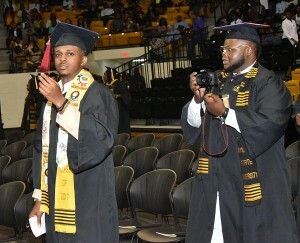 In late April, he was inducted into Alpha Lambda Delta, a freshman honor society. 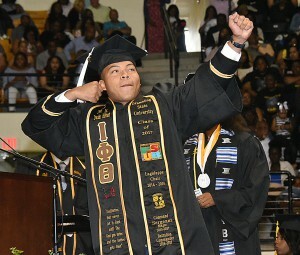 His favorite memory was when the G-Men football team won the Bayou Classic against Southern University in New Orleans. “It’s such great rivalry between two HBCUs, and it’s a really awesome to experience something like that,” said Stevie. Their mom, D’Juana Wilson, and her husband, Stevie Wilson, went in for a sonogram at three months and discovered there were triplets in her uterus. The triplets were born at 36 weeks and although the parents were overwhelmed at first, they received a lot of family support. 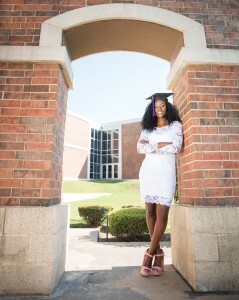 “Without family I don’t think we could’ve made it,” said D’Juana Wilson. 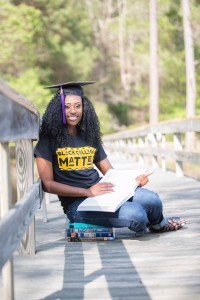 A computer science major when she attended Grambling, the triplets’ mom reflects on what her sons going to her alma mater means to her. “I have great pride and it’s an awesome feeling that they wanted to follow my footsteps,” she said. 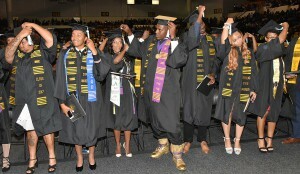 Grambling State University’s hundreds of graduates got a double dose of encouragement to support their alma mater. 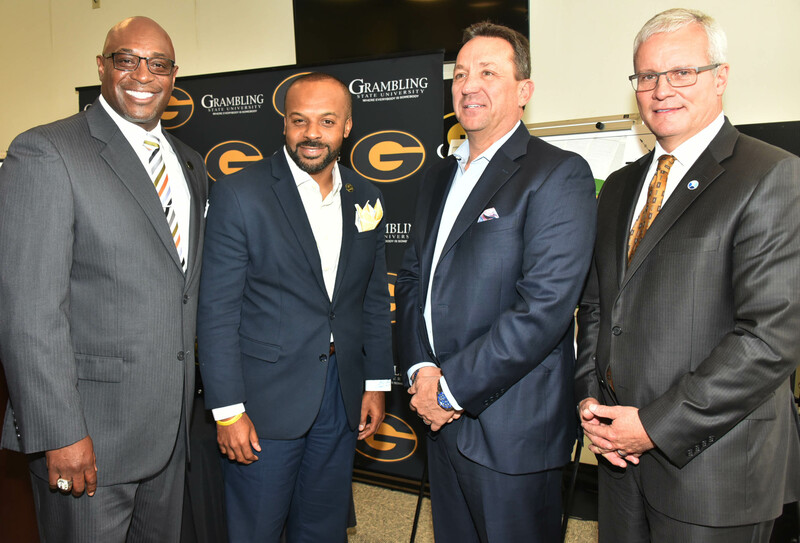 Thurgood Marshall College Fund President and CEO Johnny C. Taylor Jr. and Grambling University National Alumni Association President Russell LeDay each encouraged the new grads to support dear ole Grambling with talent, time and money. 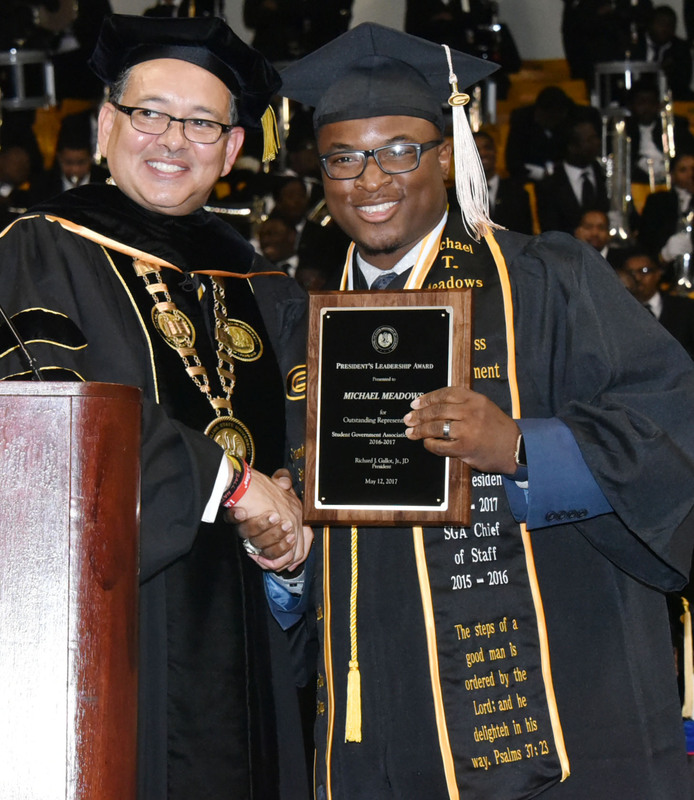 LeDay led the graduating class in an oath to actively support GSU and to be a part of the Grambling University National Alumni Association. They stood. Even class valedictorian Sha Drake stood on the main stage. 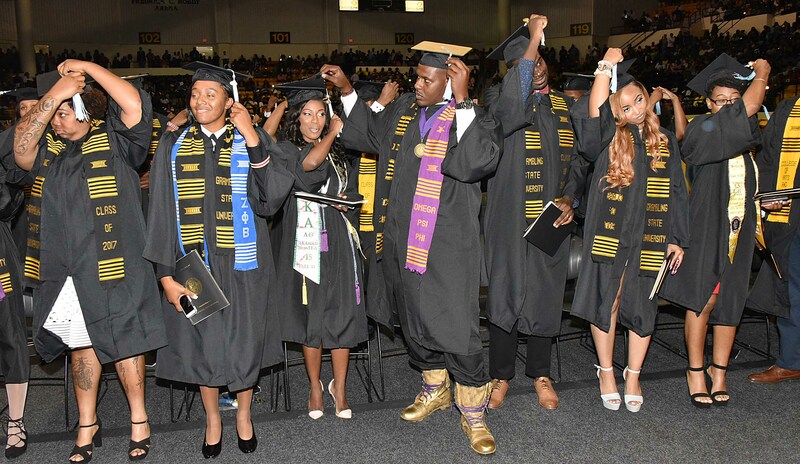 They repeated the alumni pledge, just as LeDay requested during the annual commencement program at the Fredrick C. Hobdy Assembly Center on campus. Taylor went beyond a pledge, imploring them that they are obliged to help their alma mater. Taylor, who regularly seeks funding to support College Fund member institutions, said he asks billionaires and major corporations for a lot of money – and they have a question for him: “When I go out to funders and ask them for money, do you know the first thing they ask me? What’s the alumni giving rate.” That is a big reason they must give, he said. GSU President Rick Gallot proudly congratulated each graduate as they crossed the stage, and Provost and Vice President for Academic Affairs Ellen Smiley did the same, hugging several of them, especially members of the Earl Lester Cole Honors College she leads. 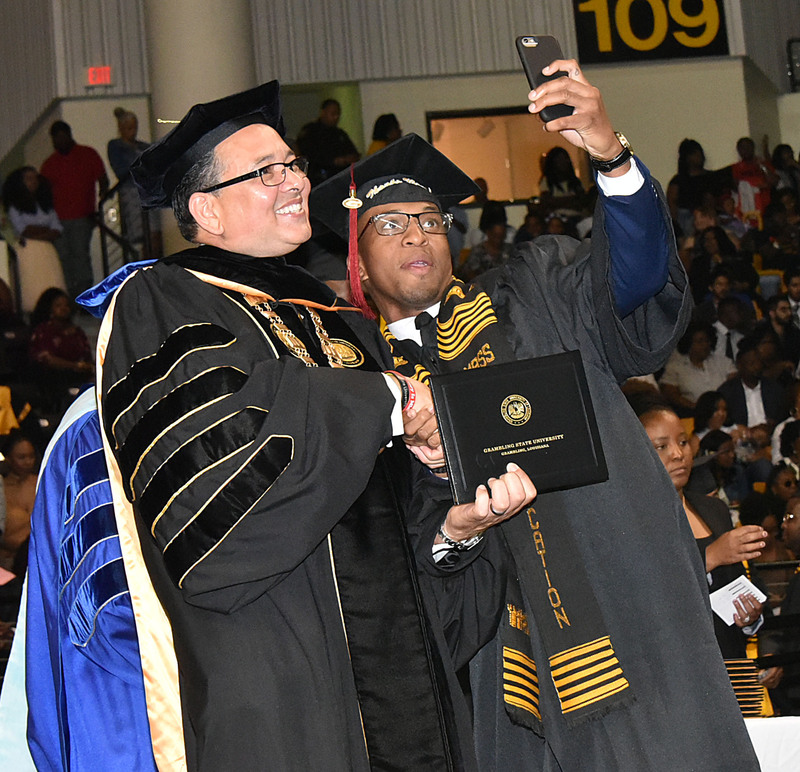 The graduation was special for all of the graduates, including 292 receiving bachelor’s degrees, four receiving doctoral degrees and 173 receiving master’s degree, a record number in recent GSU history. 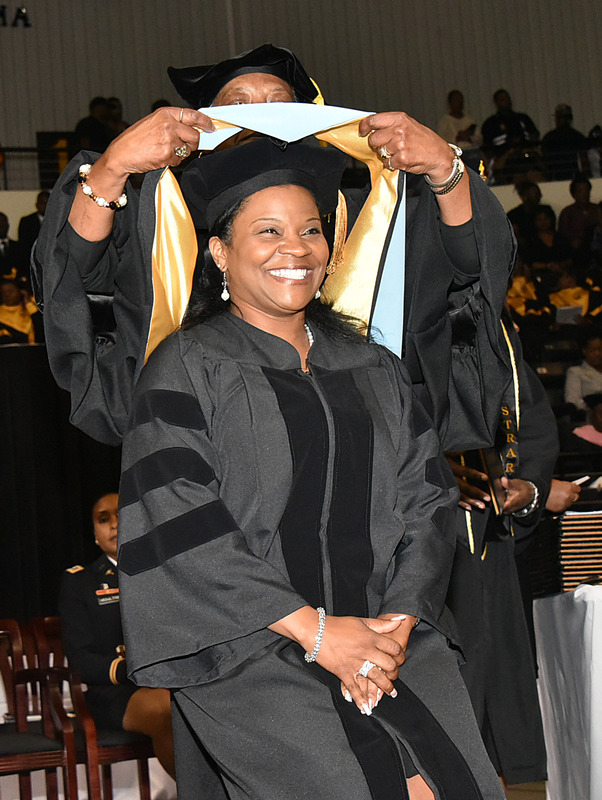 Gloria George, a Louisiana Delta Community College student success services specialist who called graduates’ names as they walked across the stage when she was working at Grambling State had her own name called as she received her doctorate. In the audience, dressed in a gold robe, was her mother, Joyce George, attending as a member of the 50th year class reunion group. The elder George, 72, retired after serving 36 years with the Caddo Parish School System as a master teacher and elementary curriculum coordinator. She insisted that the younger George, now 41, be better than average as a young student, and she’s done that. She’s spent 16 years in higher education and with Mary Kay, balancing her job as a Mary Kay team leader in middle management with her other duties, hour by hour. 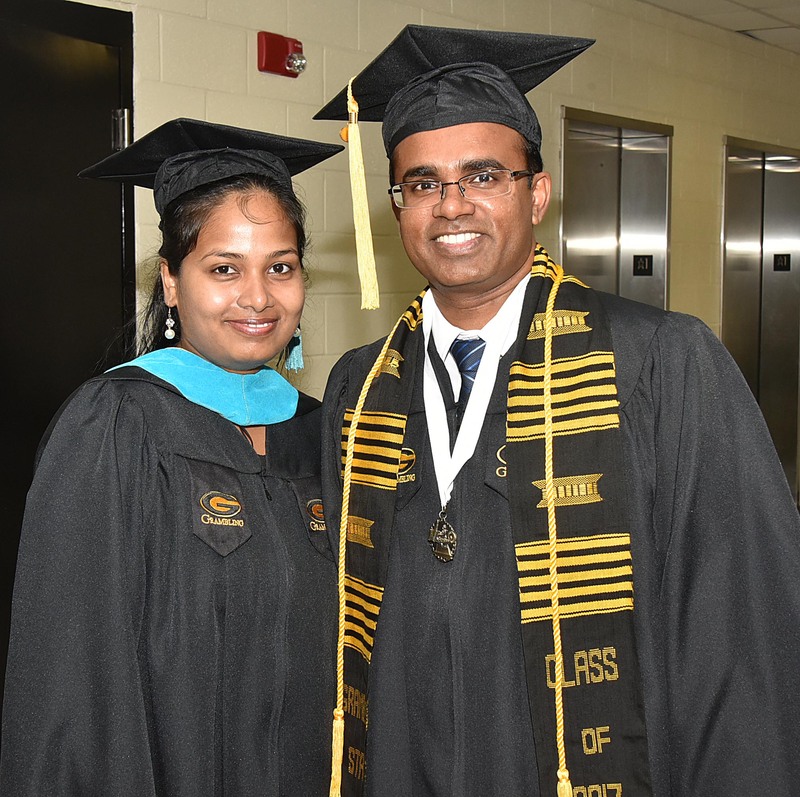 Miloni Perera works in the university’s service learning department, helping students gain valuable academic and community service experience as students to prepare them to be productive citizens after graduation. While doing her job, she was taking classes, and she graduated with a master’s in public administration with a human resources concentration. 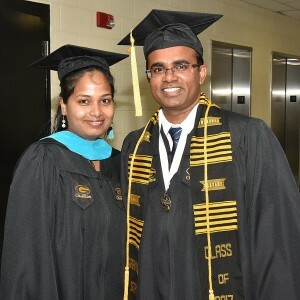 Her husband, Amila De Silva graduated with a bachelor’s in computer science. She earned a 4.0 GPA; he, a 3.9. Drake was quite the example during her tenure at GSU. She went to class, studied, worked as a student librarian and she was a star hurdler on the school track and field team. 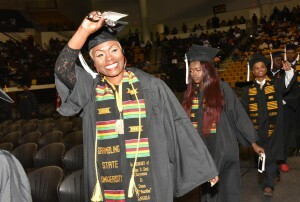 With all of that, she earned a 4.0 GPA and was presented as the class val Friday morning. 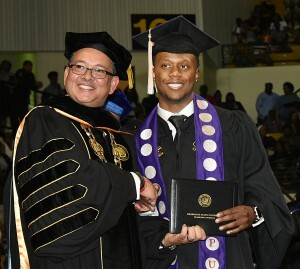 “I missed a lot of activities to do what I needed to do to be successful,” said Drake, a native of Meridian, Mississippi, heading to the prestigious Chicago School of Psychology graduate program at Xavier University in New Orleans this fall. One of the highlights was the NFL’s Chester Rogers, a wide receiver with the Indianapolis Colts, returning to walk across the stage and graduate in front of his parents and family who traveled for the moment from Huntsville, Alabama. 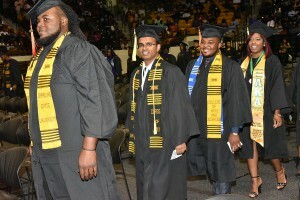 “It was a special moment, a once-in-the-lifetime moment,” said Rogers, who earned a bachelor’s in business management. This entry was posted in Uncategorized on May 13, 2017 by admin. 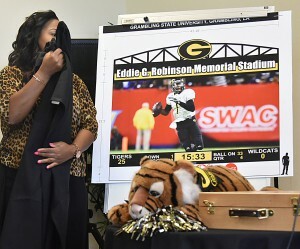 Grambling State University Director of Athletics Paul Bryant announced the first major renovations and upgrades to the Eddie G. Robinson Memorial Stadium in decades, including a total football field turf overhaul and a high-tech digital scoreboard. The project, with an estimated cost of $1.5 million to $2 million, is scheduled to start as early as next week. The aggressive construction timeline calls for a mid-August completion, just before the first game against Tulane University in New Orleans on Sept. 2 and the first home game at Robinson Memorial Stadium on Sept. 9. 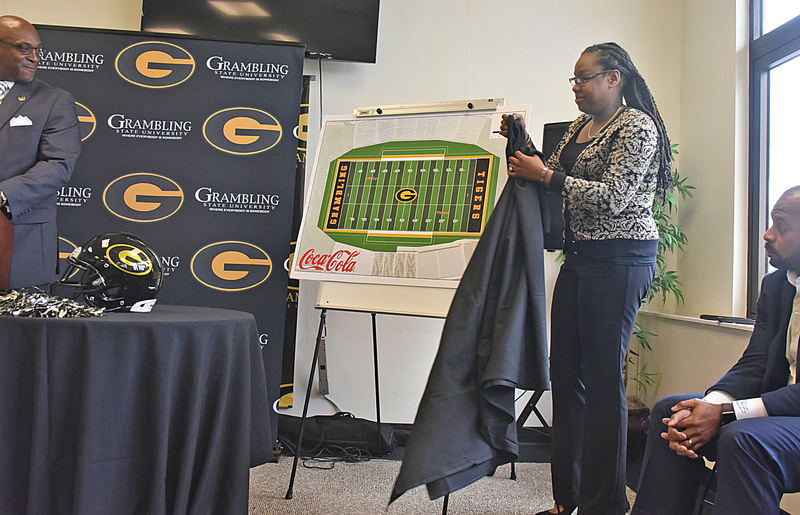 The 19,600-seat stadium opened in 1983, replacing the old Grambling Stadium, which was located not far from the university’s baseball field. The stadium replaced a huge peach orchard, and contractors dug a lot of dirt to make the sloping landscape accommodate the football field that head football coach Eddie Robinson wanted. 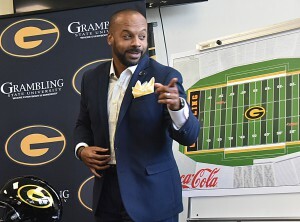 Often called “The Hole” because the entrances sit high above the field with seats in between, Grambling State fans have enjoyed G-Man football home games at the stadium for decades. In recent years, fans have clamored for upgrades. 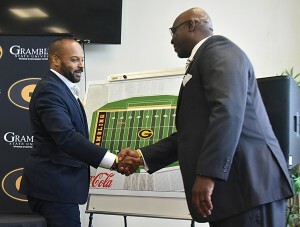 Gallot said Bryant and his athletics team brought the stadium upgrade ideas to him and he told the AD he would have to find a way to pay for the project. Bryant discussed options with Marc Newman, the school’s institutional advancement vice president, and David Aubrey, chairman of the Grambling University Foundation, and they hatched the idea to seek foundation support to finance the project. The board approved the concept just a few days ago. Bryant noted that the school’s soccer and softball fields are being renovated. Bryant said the company handling the turf overhaul and installation is Hellas Construction Inc., a nationally recognized leader in sports turf. 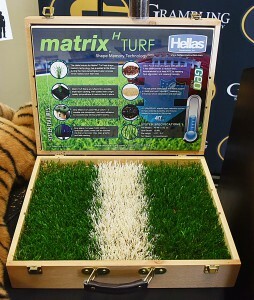 Hellas has designed and installed turf for professional, college and high school sports groups, including the Dallas Cowboys, the Jacksonville Jaguars and several Texas high school teams. A new digital scoreboard will be installed by NEVCO of Greenville, Illinois, sign installment will be done by Shreveport Neon Signs and the new sound system will be handled by Gulf Coast Sound. 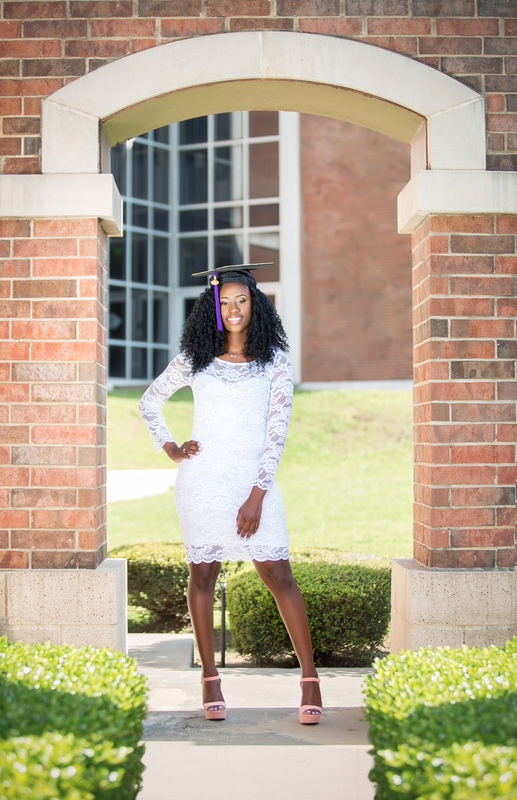 Raised by a single mother as the middle child of three girls, Shaciarra Drake was determined to be a successful runner and a successful college student. The Meridian, Mississippi, native attended Grambling State University, moving from a high school track team to GSU’s track and field team and, on Friday, she graduates as the school’s valedictorian with a 4.0 GPA during a 10 a.m. commencement program at the Fredrick C. Hobdy Assembly Center. She found out just a few days ago, and the news surprised her. 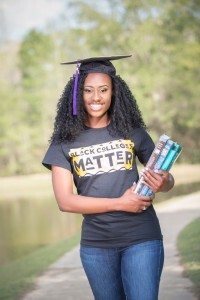 She is scheduled to receive a bachelor’s degree in psychology with a minor in sociology at 22. 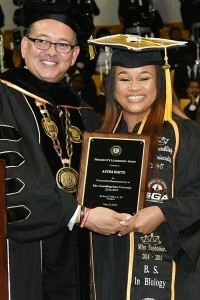 While at Grambling State, she has been president of the Psychology and Sociology Club, vice president of Pi Gamma Mu Honor Society, a member of the Alpha Lambda Delta Honor Society, the Earl Lester Cole Honors College and Miss Phi Beta Sigma 2016-2017. 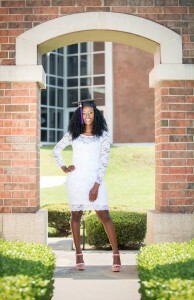 As a member of the track team, she won first place in the 100m hurdles and broke the Florida A&M record for that event. 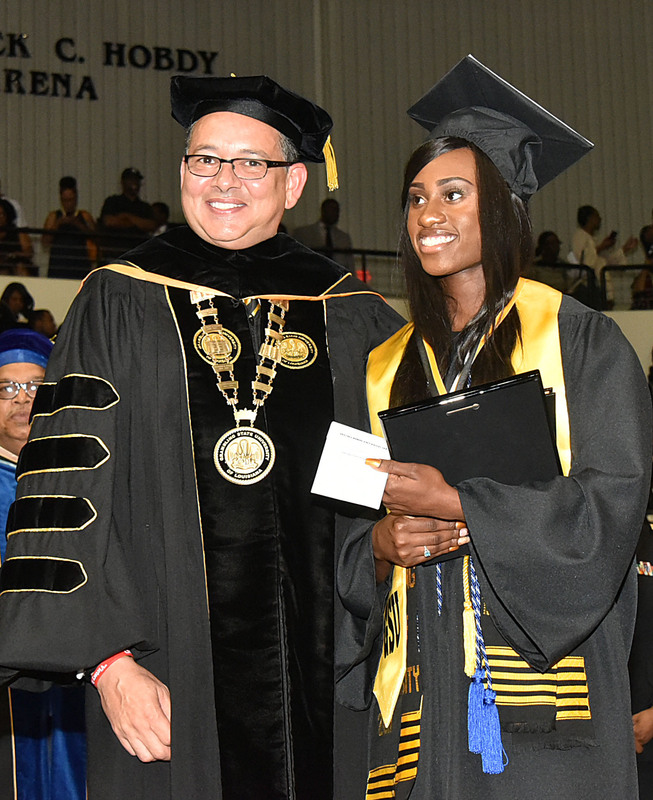 She has been an example of academic excellence, and the university administration has taken note. After graduation, Drake plans to attend graduate school for a clinical psychology doctorate at the Chicago School of Professional Psychology at Xavier University in New Orleans. She wants to be a clinical psychologist within five years. Drake wants to gain the skills she needs to better help young children. 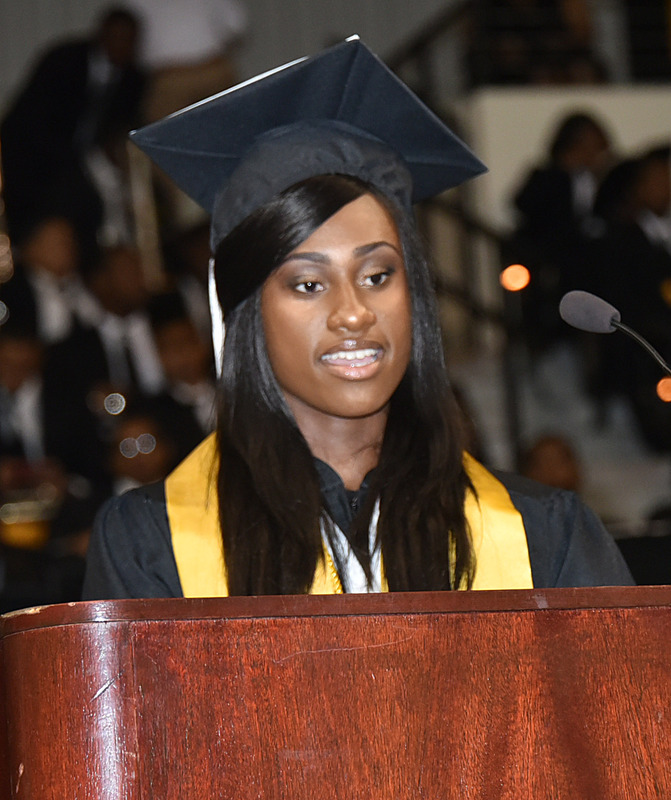 The valedictorian achievement comes with an obligation: a short speech at graduation. With just a few days notice, Drake has been considering what she wants to say. 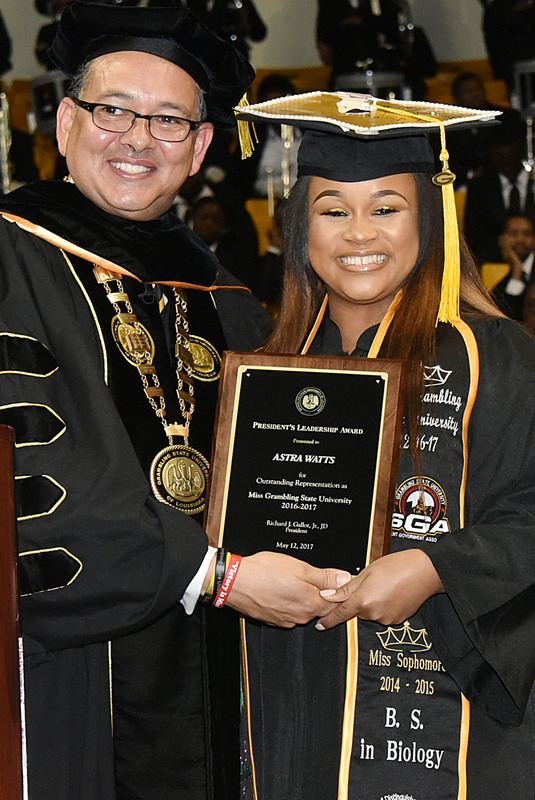 Drake said she will encourage her peers to protect and defend the legacy of Grambling State University. She plans to encourage her fellow graduates to give back to GSU with donations and networking opportunities. 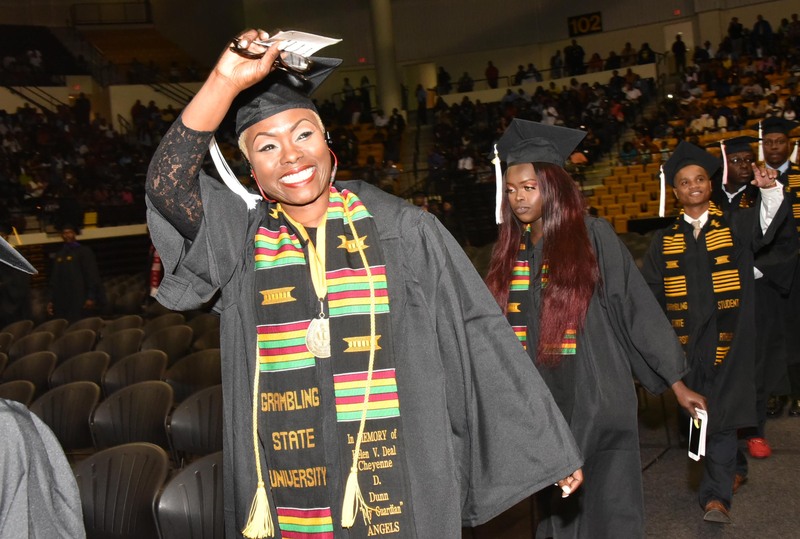 Drake lives by a Ghandi quote, “Be the change you wish to see in the world,” and she wants Gramblinites and others to know that Grambling State is a place where dreams can be achieved. This entry was posted in Uncategorized on May 10, 2017 by admin. This entry was posted in Uncategorized on May 4, 2017 by admin. Grambling State University’s Williams became the top HBCU player chosen in the NFL draft when the Arizona Cardinals called his name as the 98th pick in the third round. “I wanted to go to Arizona. 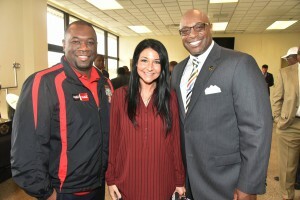 I like what they have going on and everything in between,” said the 6-foot-1 Baton Rouge native. He was named a second-team FCS All-American and first-team all-conference pick for the SWAC, catching 90 passes for 1,337 yards paired with 11 touchdowns. With a 35.5 vertical leap and dashing at 4.37 in the 40-yard dash, his head football coach said he would be a good bet, though others thought he was a long shot. 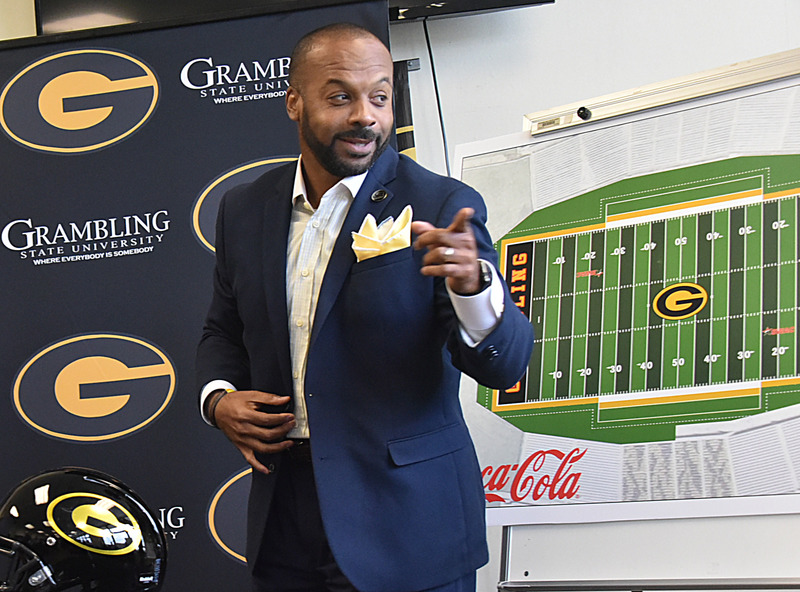 “Anytime you have a guy that catches over 2,000 yards and scores over 30 touchdowns in his career if you put that on anybody’s back you’re talking about a first-round draft pick,” said Broderick Fobbs, who coaches the 2016 HBCU National Champions. In 2015, Williams had 64 catches for 1,012 yards, 10 touchdowns, and was awarded first-team All-SWAC honors in 2015. In 2016, he helped lead the G-men GSU Tigers to a SWAC Championship and the HBCU National Championship. 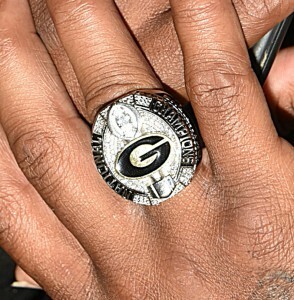 The last GSU player to be drafted was defensive lineman Jason Hatcher, drafted by the Dallas Cowboys in 2006. 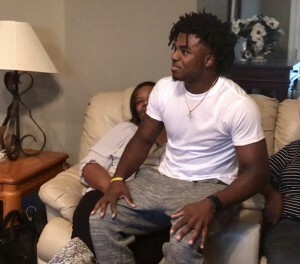 Hatcher, who retired last year, surprised Williams with a call minutes after he was drafted. “He’s been a pro for all three years that he has been at Grambling State University,” said Fobbs. 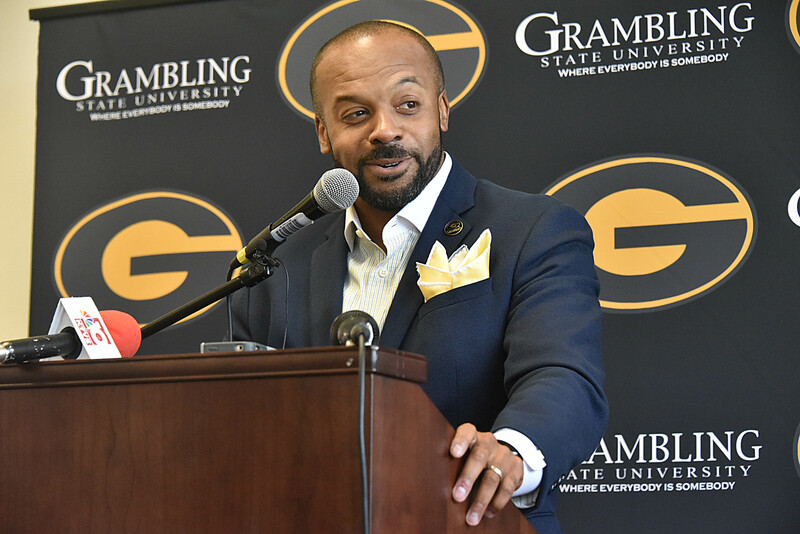 Fobbs remembers a special moment when Williams told former New Orleans Saints wide receiver Joe Horn at a Grambling State University convocation that he wanted to be where he was and he wanted to know what it took to get there. His GSU supporters are expecting big things, and for good reason. “I know he’s going to dominate because they are going to underestimate him so when they underestimate him he’s going to already have an advantage,” stated Kincade. 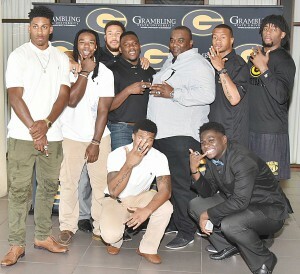 Fobbs said he expects more Grambling State players to be chosen to play in the NFL, in part based on the performances of the Indianapolis Colt’s Chester Rogers, who signed on last year as a free agent, and Williams, who was drafted. “The state of the program is on his shoulders,” he said. Stephanie Lindsey contributed to this story.